Adding a stone to one's stone or stones that are not in atari, with the result that these stones are in atari. Or placing a single stone in a position where it only has one liberty. Also called self-atari. Most often the auto-atari is a mistake or even a blunder, most frequently seen in Byoyomi, even at professional level (see this clip for example). However some cases exist where an auto-atari is intentional, for example when filling up liberties in a big eye (big eye capturing race) or when Throwing in. 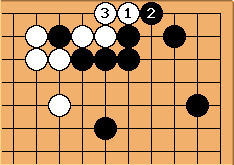 How can White make best use of the marked stones ? Move is not such a good idea. The connection of puts four W stones in atari. Black creates a lump of seven stones, which still have only one liberty left. 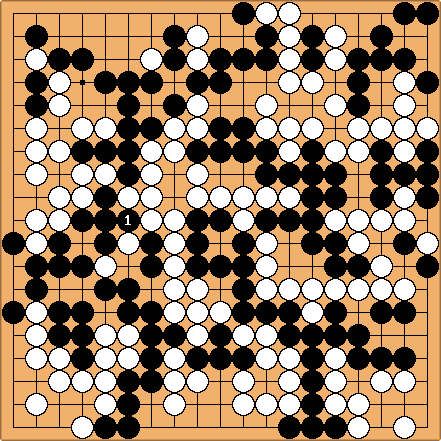 Thus Black has put into atari (auto-atari): next, White will capture them all at a.
Andrew Grant: I don't think this is a good example of auto-atari, since the five black stones were in atari to start with. To my way of thinking, auto-atari means starting with stones not in atari and putting them into atari by filling a liberty. The example in the first diagram is much better, as is the example below. Doug Ridgway: In the example above, the black stones were already in atari, so the mistake doesn't change much. Here's an example from one of my games where the consequences should have been more serious. Black played at the marked point. I was White, too bad I didn't spot the atari. coyotebd? 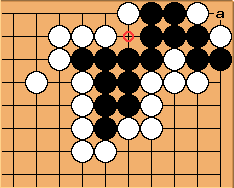 : A much better play for Black, naturally would be at a, making two eyes. Andre Engels: Actually, black has already two eyes, whatever he does (except for playing the move black actually played...) White cannot play at a because it would be suicide, and no other move stops black from playing there and making two eyes. Robert Pauli: White cannot form a killing shape at a because this would be suicide, which either is forbidden or includes self-capture. JDragon? no, a black stone at "a" is legit. Gaining liberties by capturing. And white would not "need" to play at "a" to capture, so this isn't two eyes. Tas: Yes this is two eyes. Black is alive. 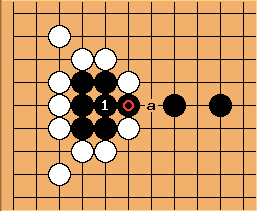 Although white circle is a ko-threat, forcing black to capture at a. 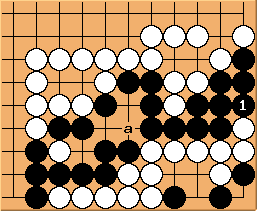 The self-atari in this game was done by mistake, causing black to lose in a previously narrow game. This is an example of "happened" instead of "use" of self atari. Dieter: the following discussion should probably be on another page. Not sure. unkx80: But I thought is auto-atari? What is the worst response to Black 1? Here's another one. White has lots of good responses to Black 1 (consider a, for instance, or perhaps tenuki). What is the worst choice? This was where I played. Dieter: and where are you going to put it ? Andrew Grant: The above discussion assumes that auto-atari is a bad move, which is of course almost always true; but once in a while it turns out to be the best move. I've given an example below. Black's only way to kill White is to play auto-atari at a. If you don't see this, look up RabbittySix. If Black starts by filling an outside liberty, such as b, white answers at a and Black can no longer kill. 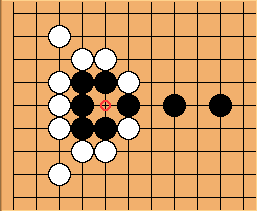 Bill: This is in the never happen department, but if Black is komaster this is a 1/3 point sente for Black. White can pick up one point in three net plays in reverse sente by making ko with . and are not the actual numbers, they just indicate the order of play. White has to win the ko twice. This is the situation to begin with. begins by sacrificing two stones, certainly in a good auto-atari (to prevent the formation of bulky five)... Do we also call auto-atari? Bill: I think not, since is already in atari. The throw-in below, certainly would not be called this way. White makes a throw in at to destroy the eye, and the cycle repeats itself when sacrifices two stones again in auto-atari.